Currently, if you are interested in deploying Service Fabric on standalone linux clusters, you'll need to create your own instance, install all of the packages and dependencies, configure the cluster appropriately via the xml spec, and run a few scripts. After all that, you'll have a standalone cluster running on one physical instance. If you are interested in checking out the manual process or want to set up a small footprint development environment, the full instructions can be found here at docs.microsoft.com. While having a small footprint linux development environment is all well and good, according to the documentation here, production level standalone linux clusters are not officially supported by Microsoft and their setup and configuration can be a complex process. This is where we can introduce BOSH to solve the setup problem and a few others that arise in the maintenance and monitoring of long running clusters that are the subject of future posts. The Service Fabric bosh-release requires the use of the newer Xenial (Ubuntu 18.04) stemcells. Other stemcells are currently not supported but may be considered in future releases. To upload a stemcell, target and authenticate with your BOSH environment and upload a Xenial stemcell which are available on bosh.io. An example for vSphere is shown below. After uploading your stemcell, you'll have to set up your networking and instance configurations in the cloud-config. The default manifest provided in the repo references the service-fabric network and vm_type. You can either add the corresponding sections to your cloud-config or edit the manifest to use existing network and vm_type definitions. Example cloud-config snippets for vSphere are provided below. here under the Cloud Providers section for AWS, Azure, GCP, vSphere, and more. If you're creating a cloud-config from scratch, be sure to look at the Example Cloud Config to base yours off of and ensure you have all of the required sections. Once you have a running director with xenial stemcells and a cloud-config, you're ready to deploy a Service Fabric cluster. The first thing you'll need is to clone the repo for the bosh-release. After cloning the repo, deployment of the default manifest can be done with one simple command. After running the deployment, you should see something similar to the task log below with VMs being created and then updated to run Service Fabric. This process takes usually between 20-30min for the base five node cluster, and 4-6min for each additional VM if you scale the instance group. Now that your cluster has successfully deployed, we can look up one of the VM IP addresses and check out the cluster web interface. To do this we can use the following command. Once you have one of the node IPs, we can open a browser and navigate to http://<node-ip>:19080 and you should see the following interface. Task 4 | 19:21:30 | Warning: Ambiguous request: the requested errand name 'smoke-test' matches both a job name and an errand instance group name. Executing errand on all relevant instances with job 'smoke-test'. At this point, you should have a Service Fabric cluster ready for application deployments. 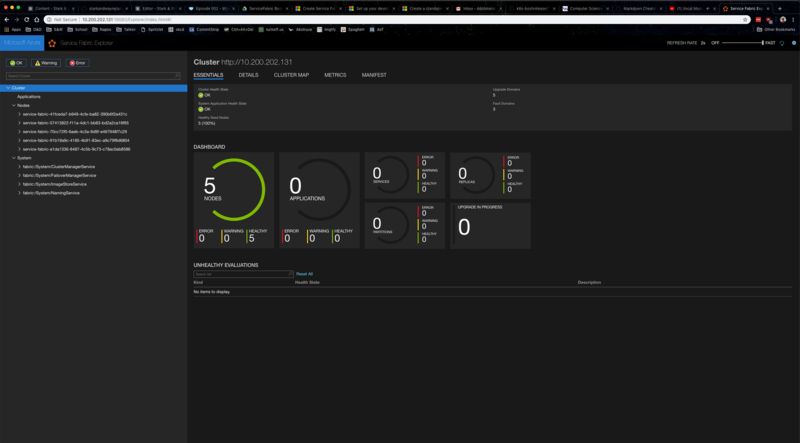 For information on setting up the Service Fabric CLI, as well as building and deploying applications for Service Fabric, check out the Quickstarts and Tutorials on microsoft.com.